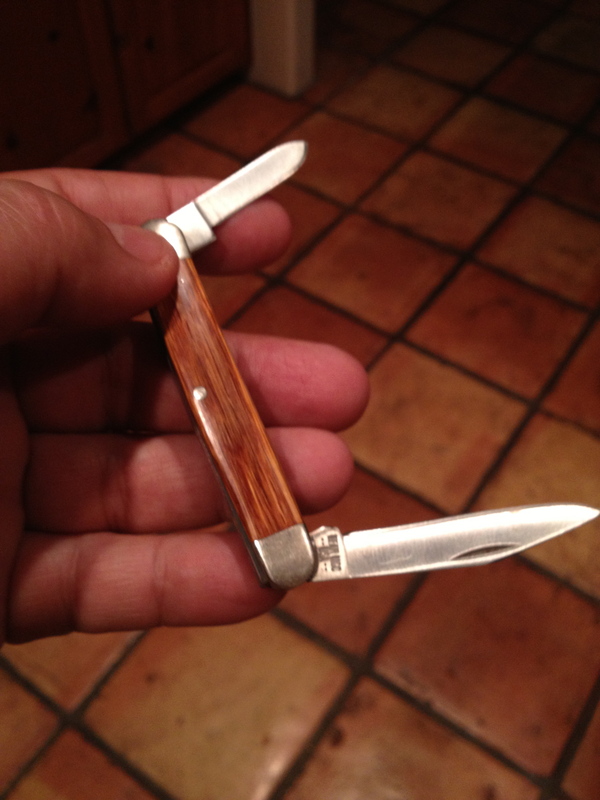 Stop right here if you haven’t read, Pocket Knife, first do it by clicking here . . . The story, Pocket Knife, on the WiseGuy, made such a difference in my life it’s hard to understand or inexplainable reasons. The story also struck a spark in my wife, Kim, as once she read the story I had written, she started thinking about the magical knife. Little slivers of memory began to come back to her, subtle glimpses of remembrance. You see, Kim has special places and always has had them. Secret hiding spots, unknown buried treasures and her own personal safety deposit box not even the bank knows about. The pocket knife in the story, for which I thought was forever lost tore at her inner being for days. She now says she remembers seeing a flash of Damascus silver steel somewhere in a dark forgotten place where she’d put it but couldn’t remember where she exactly placed it. A secret space built into a seemingly normal drawer, a hush-hush with the added pursed lips softly saying, “Shhh.” An envelope taped to the bottom of a shelf for only me to read if something should happen to her and I’m the only one left. She had felt the depths of the WiseGuy reminisce abyss. Hey, , , this would have been easy for me to make up a story of how it returned heaped in wizardry yet cautious of any sleight of hand. Or something simple like a person who accidentally stumbled on and read the story causing them to remember where it was and returned it to me. But the truth is concrete and lasting. The WiseGuy is all about the truth. I was watching some dribble on TV, although I do like The Voice, as I casually yet using my most hillbilly accent ever, answered her as I set the blueberry beer, Purple Haze, on the end table, “What?” I drew the W-sound out as far as my breath would last. Dang, and all this time I thought the tall kid lost it. My mouth is getting dry from being open so long. . .
You should hear where it ended up now! This Wiseguy is something else! An honor to Bobo always! When I was an entry clerk I took about a thousand entries from Bill, with “Yeager up”. Bill was the classiest agent at any track he was at. He and Bob were both a class act. Those were fun days. Mr. Herbuveaux, you will never know how much your comment means to me. Not only makes my day but makes my life. . . Please subscribe and share. It’s the only way to spread the stories. I’m so glad that this special knife found it’s way back to where it belonged. In your pocket I hope. I always loved coming to Turf and riding when the chance came up and remember him in the color table well. Wise guy I am Bob’s nephew, we called him Bob O. He had an impacting affect not only on my life, but on many lives just as he had on yours. Bob and Jody have spent the last nearly 2 years with us and he laughed and aid his famous one liners on us until his last breath. God bless your work. I HAVE BEEN READING YOU FOR A WHILE NOW AND YOU JUST GET BETTER WITH TIME. Like running into an old friend. Happy, happy, happy! Awesome! I love a happy ending!!! That wife of yours is always full of surprises!! !